Plenty of professionals and businesses rely on task managers to keep everything on track. 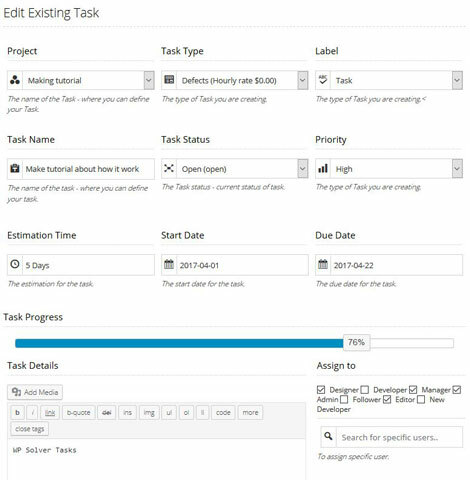 Task Manager Pro for WordPress is a cool plugin that lets you manage projects and tasks within WordPress. You will be able to create tasks/projects, manage users, and assign tasks to specific groups. Task Manager Pro comes with a simple interface for creating new tasks with status, type, date, and other important settings. You will be able to see task list and details, decide who handles what, and a lot more. It lets you keep up with the status of your projects and show project info on site. This plugin is responsive and supports desktop and mobile platforms. It could prove quite useful for fast growing websites and businesses.